Fast And Furious Worse Than Watergate - If you want to see a liberal media members head explode, compare Fast and Furious to Watergate. If you want to see an entire newsroom freak-out say that Fast and Furious is worse than Watergate. The Activist Old Media has spent this month celebrating the 40th Anniversary of Watergate. Make no doubt about it, they are celebrating. They worship at the alter of Woodward and Bernstein for two reasons. 1) They took down a Republican President, 2) The media broke the story. Nothing can replace this perfect storm in their minds. Those are also the reasons the media will not give Fast and Furious the respect it deserves. With a Democrat in the White House and his reelection on the line, this is the absolute worst time for a scandal like this to blow-up. The story of Eric Holder and the contempt vote must go after a hot day in June, as it was treated by ABC World News Tonight. They are being dragged kicking and screaming to this story and will drop it as quickly as they can. Compare the coverage of Fast and Furious to the four years of coverage of the Valerie Plame leaking "scandal" from the Bush White House days that ended in flameout for the Democrats and their media friends. Also, since bloggers broke this story, the Activist Old Media cannot take ownership and create shrines to fellow "journalists." CBS says that Sharon Atkisson broke the story, but it was on the 'net before it went to the Net. Certainly, Atkisson has done a great job on this story, so good that she has been yelled at by Holders lackeys. She was the first network news reporter to do the story partly because the other networks have been historically absent on this story, until now. But, no network "broke" this story, as they claim. It's a brave new world out there on the internet, and the Activist Old Media is doing everything it can to ignore and diminish that fact. Blind by choice. There are many elements that make Fast and Furious #WorseThanWatergate. Brian Terry's death and the deaths of 300+ Mexicans should be first on that list. Nobody died in Watergate. It was a botched burglary of Democrat campaign headquarters by Republican operatives. Then came the Richard Nixon cover-up. We have always been told the cover-up was worse and it brought down a President. In Fast and Furious, both the operation and the attempted cover-up are scandalous. Holder has already lied many times to Congress and now Barack Obama has become the first President to use Executive Privilege to keep secret his own documents that he claims he has never seen. The media can't see the historic relevance here because they don't want to see it. Blind by choice. Concocting a scheme to put the most dangerous hand-held weapons on the planet in the hands of Mexican drug cartels should be enough to bury anybody and everybody responsible. Congress wants to see how far this scandal goes up the food chain and they have been blocked at nearly every turn. 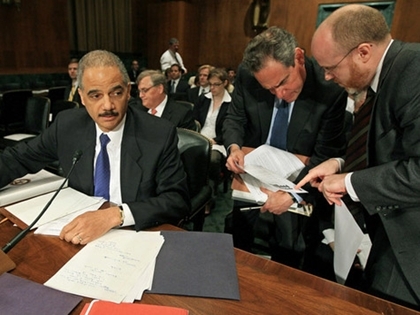 Oh, Holder has turned over some documents, but it is clear there is more out there that this administration is hiding, or why the Executive Privilege? I guess that part is hard for the Activist Old Media to figure out. They are busy popping the champagne corks on 40 year old Dom.